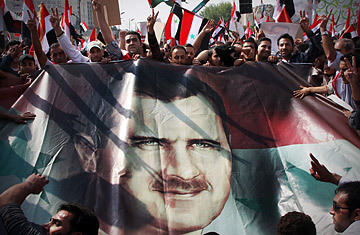 Syrian regime supporters flash the V-victory sign as they hold up a portrait of Syrian President Bashar Assad during a rally at Umayyad Square in Damascus, Syria, October 26, 2011. On the surface, the Arab League appears to have successfully negotiated a deal with Syrian President Bashar Assad to end his bloody eight-month crackdown on largely peaceful protesters. But appearances are always deceiving, especially when the subject is the regime in Damascus, which has found endless ways to perpetuate itself, and the chief broker of the deal is a perennially ineffectual pan-Arabist dinosaur. On Wednesday, the Arab League announced from its Cairo headquarters that Syria had accepted the agreement without reservations. The pact calls on Assad to withdraw his security forces from the streets, stop violence, free all political detainees, hold a national dialogue with the opposition within two weeks and allow the media, the Arab League and international monitors access to the closed country. "The agreement is clear," Qatar's Foreign Minister, Jassem bin Hamad, said at a press conference in Cairo. "We are very happy that we have reached an agreement and will be happier when it is implemented." That is the catch: implementation. It's not the first time the Arab League has given the Syrian regime a window to end its ferocious campaign against pro-democracy protesters. A two-week timetable to do so recently came and went with no consequences for Damascus. Turkish Prime Minister Recip Tayyip Erdogan, Assad's once formidable ally, has also huffed and puffed and warned Syria to end its repression, but to no avail. In fact, the League put forward an almost identical plan months earlier that was rejected by Damascus. Why was it accepted now? The bottom line is that without an "or else" clause  which this deal apparently lacks  the success or failure of any agreement is likely to rest entirely on the Syrian regime's willingness to comply. The closest thing to a warning the Arab League could muster on Wednesday was the threat to hold another meeting if Assad ignores it. NATO also reiterated this week that it had no plans to intervene in Syria, under any circumstances. Other details of the deal were also unclear. Where will the national dialogue be held, for example, and with whom? Assad has insisted on talks in Damascus, whereas many opposition members, especially those in exile, have said they fear returning to their homeland lest they be arrested or worse. They have suggested Cairo and other Arab capitals as alternatives, proposals the regime has rejected outright. The deal certainly doesn't go far enough for the Syrian National Council (SNC), the umbrella group recently formed to unite the country's disparate opposition elements, which had urged the Arab League to freeze Syria's membership. The Syrian Revolutionary General Commission, a grouping of some 40 bodies that are not part of the SNC, dismissed the plan as well, saying it would accept nothing less than the toppling of Assad's regime. Many activists view the deal as just a way for Assad to buy time. Even as it was being announced, some two dozen deaths were reported in Syria, adding to the 3,000 the U.N. says have occurred since protests erupted in mid-March. So, will Assad do it? Will he withdraw his much-feared security forces? It'll be quite the gamble on his part if he does. A withdrawal "would mean millions taking to the streets and very possibly, quite rapidly seeing what we witnessed in other revolutions such as Egypt," says Rami Jarah, a Syrian activist who recently fled to Egypt. "I expect new approaches of repression that don't necessarily involve army tanks and uniformed troops ... We have no trust whatsoever in the Syrian regime." Activists have called for massive marches on Friday to test the government's commitment to withdraw its forces and end the violence. Still, the reaction to the Arab League initiative was not all negative. Shakeeb al-Jabri, a Beirut-based Syrian activist, said that although the plan was "far from ideal," if implemented it would alleviate pressure on the Syrian opposition from the security forces. "It will also be a relief to see all our illegally incarcerated friends released," he said. "I'm hoping to see its implementation on the ground soon but worried that this may become a game of procrastination." See photos of protests in Syria. Read about Syria accepting the Arab League's proposal.